The increased use of chemical fertilizers and pesticides in crop production has adversely affected both the environment and the agricultural economy. Not only has it led to environmental pollution, but also the increasing costs of chemical inputs and the low prices received for agricultural products have contributed to economic unprofitability and instability. The International Symposium on Agricultural Ecology and Environment was organised in order to discuss ways of achieving the goals of economically and environmentally sustainable agriculture. It is apparent that a truly multidisciplinary effort is required and for this reason the meeting was attended by authors from many different disciplines and geographical locations. 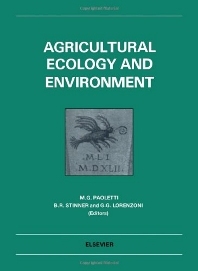 Although their papers reflect a wide diversity of agroecosystem types and examples, several common themes emerge: the increased importance of biotic control of ecosystem processes in lower input systems; the key role of soil organic matter in stabilizing nutrient cycling; the importance of agricultural landscape diversity and complexity; the importance of studying ecological processes in natural and agricultural ecosystems; the critical need to integrate socio-economic and ecological approaches. Introduction. General Concepts (5 papers). Economics and Cultural Analyses (4 papers). Landscape Ecology (8 papers). Biotic Interaction (10 papers). Practices and Procedures (9 papers). Composting and Biogenic Wastes (13 papers). Environmental contamination and toxicology (7 papers). Regional Projects (5 papers). Author Index. Subject Index.